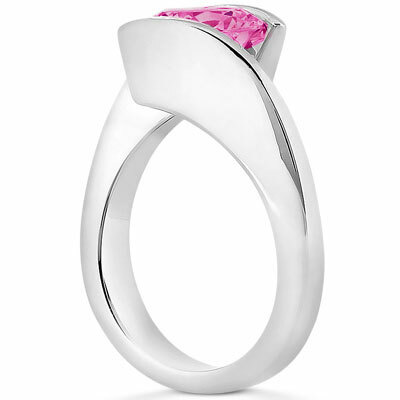 This tension set pink topaz solitaire ring in 14K white gold is a bold, modern statement, perfect for any woman with an eye for feminine yet daring style. The 6.5mm round pink topaz that's held by this cotemporary piece conveys a sense of girlish glamour that's all grown up. This bright, sparkling stone is hugged by a unique tension setting of 14K white gold that squeezes it from the top and bottom as it flows from a simple, shining band. A 6.5mm pink topaz is tension set into a 14K white gold setting. 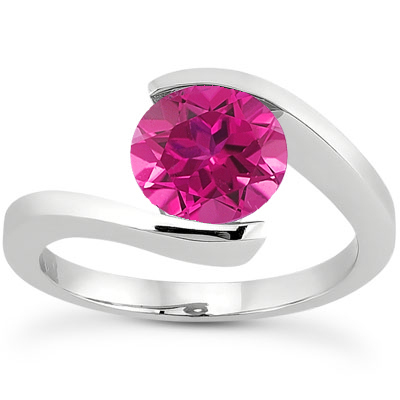 We guarantee our Tension Set Pink Topaz Solitaire Ring to be high quality, authentic jewelry, as described above.